Maurizy C, Quinternet M, Abel Y, Verheggen C, Santo PE, Bourguet M, C F Paiva A, Bragantini B, Chagot ME, Robert MC, Abeza C, Fabre P, Fort P, Vandermoere F, M F Sousa P, Rain JC, Charpentier B, Cianférani S, Bandeiras TM, Pradet-Balade B, Manival X, Bertrand E. The RPAP3-Cterminal domain identifies R2TP-like quaternary chaperones. Nat Commun. 2018 May 29;9(1):2093. R2TP is an HSP90 co-chaperone that assembles important macro-molecular machineries. It is composed of an RPAP3-PIH1D1 heterodimer, which binds the two essential AAA+ATPases RUVBL1/RUVBL2. 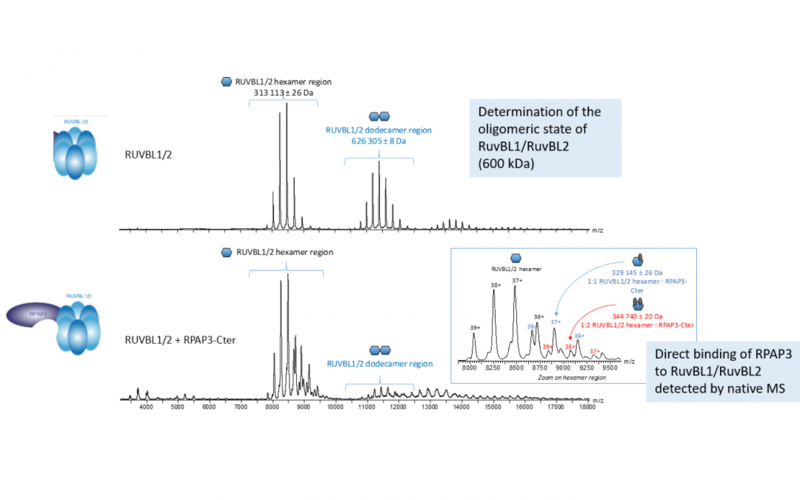 Native mass spectrometry allowed determination of RUVBL1/RUVBL2 oligomerization state with measured masses > 626 kDa for dodecamers. When its RPAP3 is bound, the equilibrium shifts towards hexamers able to bind up to 2 RPAP3 molecules per hexamer.